Spicy baked fries covered in a gooey cheese blend. Microwave on high for 3 to 4 minutes. Let cool. 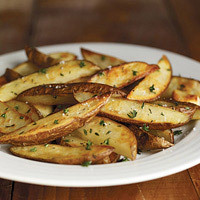 Cut each potato lengthwise into eight, even wedges. In a mixing bowl, stir together the chili powder, chopped cilantro, onion powder, garlic power, and ground cumin; set aside. Arrange the potatoes in a single layer on a baking sheet. Sprinkle spice mixture onto potatoes and toss to coat. Bake for 10 minutes until the potatoes are crisp, rotate and cook an additional 10 minutes until dark golden brown on all sides. Sprinkle shredded cheese onto cooked fries and bake for another minute or two to melt cheese. Transfer to a plate and serve.